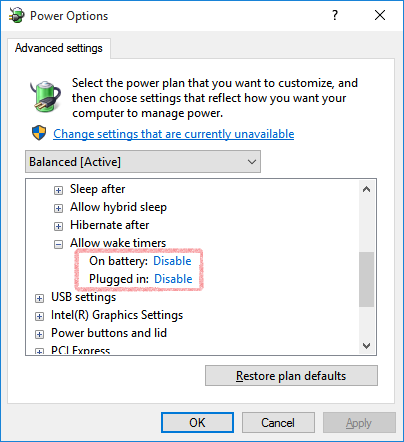 How to prevent Windows 10 waking from sleep when traveling in bag? I am not turning laptop off, but rather putting into hibernation, as it starts much faster and I can continue working without starting all apps again. It was working long time from Windows XP to Windows 8.1. However now (after upgrade to Windows 10), when I just take my laptop out of the bag after a travel, it was quite hot. I've realized that it is turned on. Wake Source: Unknown, but possibily due to timer - Windows will execute 'NT TASK\Microsoft\Windows\UpdateOrchestrator\Reboot' scheduled task that requested waking the computer. When I located the task above in the task scheduler, it has trigger in that time, however the "last run time" is day before. So I do not know what to believe "last run time" or the wake source from the event above? How to find out what is waking the computer from the hibernation (it is possible?) and how to prevent it? 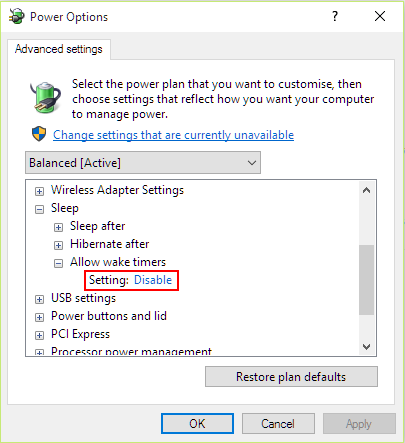 Go to "Sleep->Allow wake timers" and change the setting to Disable. 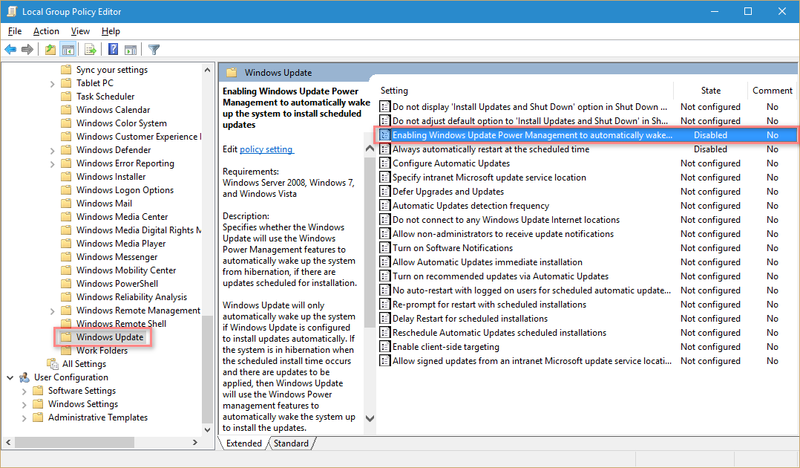 Double click on: Enabling Windows Update Power Management to automatically wake up the system to install scheduled updates and set it to "Disabled". After upgrading to Windows 10, the computer in my bedroom kept waking me up at 3AM. Disabling Wake the computer on the Microsoft\Windows\UpdateOrchestrator\Reboot scheduled task didn't help. Windows turns the flag back on periodically. Even disabling "Disable wake timers" in Power Options didn't help. The UpdateOrchestrator kept orchestrating midnight alarms. As a solution I've added a powershell script that removes wake settings every hour. Open Task Scheduler and create a scheduled task. In the "Triggers" tab, create a trigger that runs the job daily and repeat every hour. The PowerShell commands come from this blog post by Reidar Johansen. 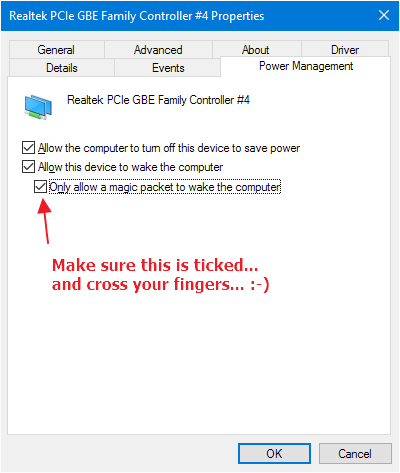 I am using Wake On LAN (WOL) feature on my computer so that I can wake up my computer remotely if I need to access it while I am away.. in order for WOL to work is that I have to allow my network card to wake the computer when I send the WOL magic packet. That appears to be the system maintenance task running. If so, you might try disabling system maintenance. WIN+R control search for "maintenance" in the search box, select "Change Automatic Maintenance settings". Clear the "allow scheduled maintenance to wake up my computer at the scheduled time". See if that helps remove the issue. It's going to be a lot more reliable than some of the other mechanisms proposed. To test the script manually ensure you run it from an elevated PowerShell instance (Run as Admin). I ran into problem where UpdateOrchestrator re-enabled itself again. This ofcourse caused my computer to wake up from sleep mode by itself (seriously snap you microsoft for also waking me up in the middle of the night). Found some info on reddit that seems to solve it. Run icacls "%WINDIR%\System32\Tasks\Microsoft\Windows\UpdateOrchestrator\Reboot" /inheritance:r /deny "Everyone:F" /deny "SYSTEM:F" /deny "Local Service:F" /deny "Administrators:F". This will prevent the task from being enabled again. This assumes you're running an English version of Windows - translate the user names as necessary or find the SIDs, if required. Modify "Configure Automatic Updates", you can enable it and set it as "2 - Notify for download and notify for install" or "3 - Auto download and notify for install"
This way the system doesn't even have the chance to start installing updates, which results in waking up and rebooting in most cases. In addition, you have the control over when to update. when you go into advanced power setting I found under wake timers you will see disable wake timers then under that you will see an important wake timer, disable that one too. Not the answer you're looking for? Browse other questions tagged windows-10 sleep hibernate windows-task-scheduler or ask your own question. How to prevent windows updating the UpdateOrchestrator\Reboot task? How to prevent some program to wake up my PC? How do I prevent the Windows 10 “Maintenance Activator” from waking my PC randomly (even after disabling wake timers)?